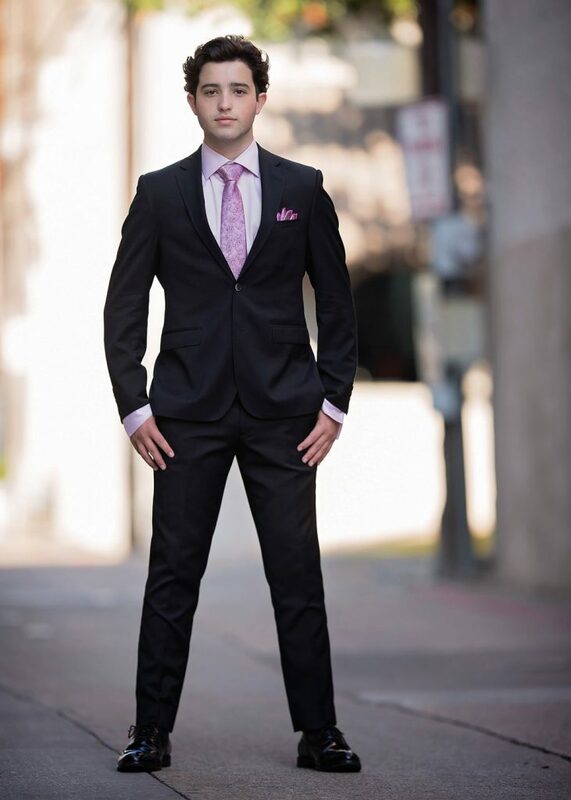 The trend in menswear for weddings, proms, and other formal events has been to choose a well tailored, custom made suit that matches the theme, season and formality of the occasion…, a shift has been taking place and more men are embracing an attire selection as a reflection of their style and personality. The two main wedding day looks for guys, suits and tuxedos, remain the most popular among grooms. It would seem like it would be an easy choice, but the decision to don a suit or a tux on the big day can be a challenging dilemma. 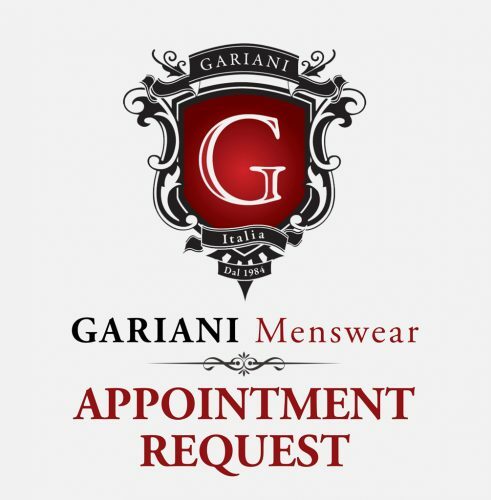 With over 3 decades of combined experience, our experts at Gariani Menswear, Antony and Ramzy, will provide you with superior, world­ class service and guidance. You can depend on us for utmost courtesy and excellence. Whether you’re getting married or you’ve been invited to a wedding or formal event, it’s important to know the difference between a tux and a suit, and when it’s appropriate to choose one over the other. The primary physical difference between a tuxedo and a suit is the presence of satin. Typically, tuxedos have satin facing on the lapels, buttons, pocket trim, and a satin side stripe down the leg of the trousers. Suits usually don’t incorporate any satin. As for the accessories, tuxedos are traditionally worn with bow ties and a vest or cummerbund, while suits are traditionally worn with a long tie, alone or with a matching vest. Basic AlterationsNote: With the addition of shoes we offer special package pricing. Let’s talk about some rules surrounding weddings for a minute. What kind of wedding have you and your bride-to-be planned? Is it a formal event set in a ballroom? A casual dinner in a marquee? An outdoor buffet set in the grounds of a country club? You may not have given thought to how much your surroundings will influence your clothes, but the bride definitely has. Is there a picture of your uncle wearing flares or disco pants at his wedding? That’s what happens when the groom chooses ‘trendy’ over timeless. Go for a classic look if you don’t want to cringe at your wedding photos in 10 years’ time. You will have access to a great suit for future use that is already in your closet. Plus buying means you can get it tailored to it fit you like a glove. If you’ve decided on a tuxedo and don’t think you’ll wear it again, renting might be the more sensible option; however, if you’ve decided on a suit, you’ll probably get the chance to wear it several times a year, so it’s worth the investment. If you’re a flashy guy who likes color in your daily life, you may be tempted to buy your groom’s suit in a shade of green or red, which may haunt you for the foreseeable future. Black, white, dark grey, midnight blue – keep it cool, keep it classic. Suspenders and pocket squares are a nice way to add some individuality to your formalwear; just make sure you don’t overdo it and lose the elegance of the original look. Many experts will also recommend keeping cufflinks simple, in either gold, silver or onyx. If buying, it’s just as big a priority to spend your money on a good tailor as an expensive suit. The success of a superb 3-piece suit rests on the cut and fit, more than the amount you spent on the original model. Allow Gariani Menswear to work with you to plan your wedding wardrobe. We have the ability and expertise to offer illuminating recommendations. 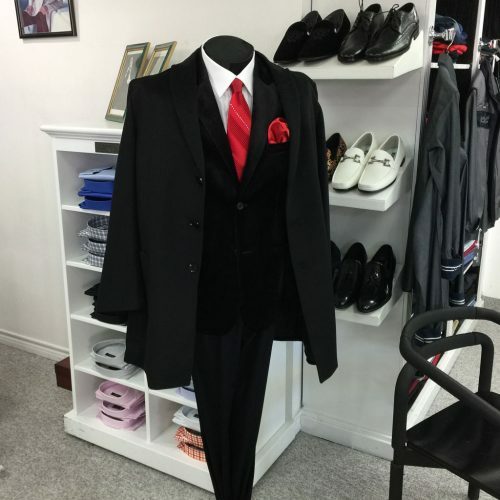 We offer complete custom services for unique formal wear, suits and shirts as well as a selection of made to measure items that will help you coordinate your wedding party. Another great way to assess which side you end up taking in the suits vs. tuxes battle is to look at the pros and cons. can be worn multiple times after the wedding day to all sorts of events. can be more personalized to fit the groom’s look. are easily paired with details, such as handkerchiefs, buttons, shirts, etc. are usually more comfortable for the groom/groomsmen. great for slightly-less formal or informal weddings. light-colored suits aren’t as versatile (often cannot be worn in ritzy restaurants and for some occasions & seasons). look out of place at really formal weddings. great for formal, black-tie weddings. often look more polished and create more cohesion between groom/groomsmen. often cannot be worn very much after the wedding day (unless the groom attends many formal, black-tie events). are very expensive to buy outright. look really out of place at informal weddings/events. require a special type of dress shirt (typically white with black buttons). Wedding theme. If you’re having a black-tie wedding, you should definitely wear a tuxedo. Consider what your bride is wearing. Will she be wearing a gown? Or is her dress less formal? If she’s wearing a tea-length dress for your summer wedding, you should probably opt for a suit. When it comes to deciding between a suit vs. a tux as a wedding guest, take a look at the invitation. If the invitation says, “White Tie,” “Black Tie Invited,” or “Black Tie Preferred,” you should wear a tuxedo. If the invitation says, “Black Tie Optional” or “Formal,” you may choose to wear a tuxedo or a dark suit. For all other weddings, your best bet is to wear a suit. The point of dressing up for your wedding or formal event, isn’t simply to look your best. That’s a big part of it, but it’s also to commemorate your big day out in an ensemble that’s designed for that very purpose. For the person looking for something truly special, Gariani Menswear specializes in handcrafted custom clothing for men and women. Our suit service is an encounter in refinement that every man should experience. A suit says that you’re a very well put together, competent, dashing, and productive member of society. Buying a great, custom tailored suit for your wedding or formal event is an investment that will pay off. Every man needs at least one great suit in his closet.